Engage Boston was all about the power of people. Whether you joined us in Boston or followed along remotely, here are the most memorable moments from the final day of Engage. 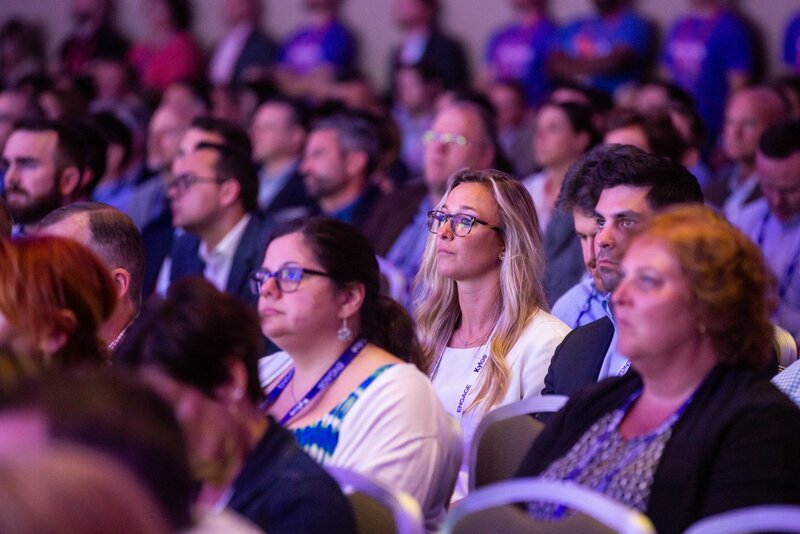 Catch up on more Engage 2018 highlights and recaps here. Survey Results: What do you do for a living? I’m in the people business. I help great companies find great people. When questioned on what you do for a living, don't say "I do #Staffing"
“The word ‘work’ resonates with talent and employers,” Papas said. The top supporting word was “solutions.” Will everyone who attended Engage change the way they introduce themselves? Probably not, but the goal was to start the conversation. Words matter, and the way we describe our work matters. It’s up to all of us to take it from here. Adecco Staffing U.S. President Joyce Russell joined Art Papas for a fireside chat. Russell is well-known in the industry. Having been with Adecco for 30 years after working her way up through the ranks, she now has nearly 2,000 people working for her and is the most senior-ranking woman in the U.S. staffing industry. People want to work for companies that deliver something the customer doesn’t expect, Papas said. Russell added that this shouldn’t just be done at work with customers and employees. She said delivering a cherry-on-top experience should extend to spouses, family members, and friends. Russell also believes in the power of relationships. She’s in a women’s executive leadership organization called the Group of 200 and a Fortune women’s group. “I can’t tell you how the power of those relationships changed Adecco,” she said. Along with other senior management members of Adecco, Russell also attends the annual World Economic Forum in Davos-Klosters, Switzerland. “We’re there to talk about talent and last year I spoke on a panel about our hundred-year life,” she said. If a baby is born today, it will live to be over a hundred, and in Asia, the life expectancy is 107 years old. “We used to retire in our sixties, but you can’t play golf for forty years,” she said. People will need to work — and that might mean gig work. Russell said her husband spent 30 years at GlaxoSmithKline, retired in his mid-fifties, decided to coach basketball, and is now a referee in Division Three college sports. “He’s showing me that you can do amazing, different things,” she said. Papas asked Russell how she hires for her high-caliber team. 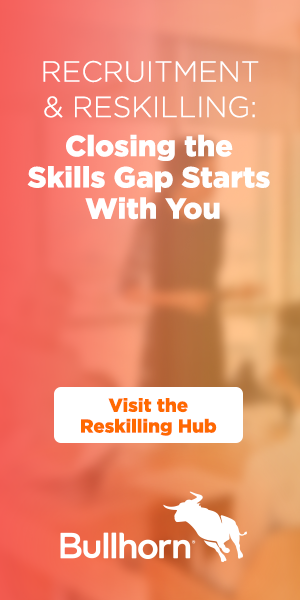 She said she believes that selecting talent is one of the most important skills that a leader has — if not the most important. She said she asks a lot of questions, like “Give me your best success story before the age of 18.” “We’re looking for resiliency and grit,” she explained. “As parents, we’re making it easier for our kids and we shouldn’t; I tell my kids they may be smart, but if they can’t work, it won’t work.” Another favorite question is to ask the candidate the last time they stepped out of their comfort zone to help someone else. Papas noted that balance was a big theme of Russell’s and she recalled hearing Susan Welch (wife of Jack Welch) say that decisions should be based on the 10-10-10 rule: how they will affect you in 10 minutes, 10 months, and 10 years. Russell told the company that she couldn’t go to Asia, and they told her to send her best person instead. Papas concluded, “I love everyone in this room, but I love my family more.” He said it’s important to build the right team so you’ll be able to send someone else. How will technology affect the work we do in staffing? Matt Fischer, president and CTO of Bullhorn, moderated an informative session with Brian Delle Donne, president of Talent Tech Labs; Eleanor Vajzovic, head of Adecco Group X; Chris Loope, chief digital officer at EmployBridge; and Christopher Dwyer, VP of research at Ardent Partners. Donne said that artificial intelligence (AI) is an intelligent machine that’s able to engage, understand, respond, and act on the fly. It can learn and respond with unmonitored inference. While there’s very little true AI happening in recruiting and staffing today, it will increasingly be on the market. Dwyer notes that only 13 percent of companies are using AI today, but predicts that number should jump up to 45 percent. According to Loope, EmployBridge wanted to use data to make better connections with candidates and create better job matches. He said the company is creating algorithms that match people with jobs and exploring ways to increase the quality of data. 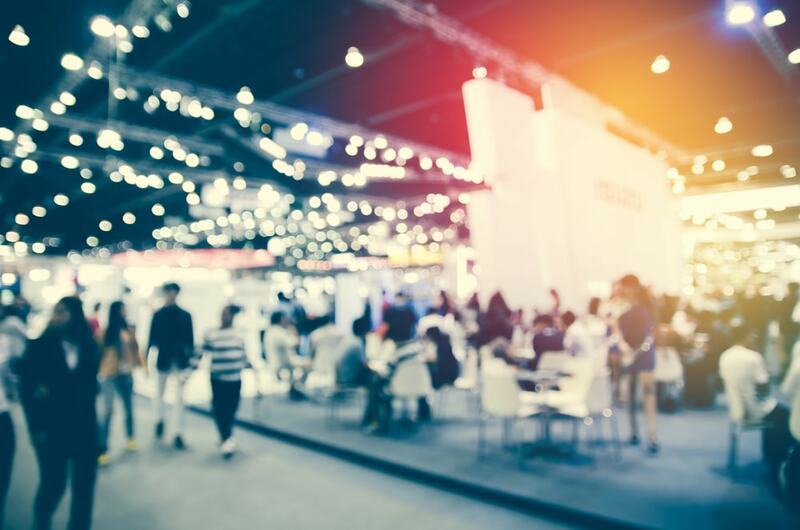 Vajzovic said there’s a lot of marketing happening but it’s important to focus on education and practical use in order to win over your colleagues in procurement and budget planning. Wes Gay is an entrepreneur, writer, Forbes contributor, and an expert on millennial leadership and the impact of millennials on the workforce. Gay said we all hate talking about millennials — including millennials. It’s the most-researched generation and everyone likes to call themselves millennial experts, but we still don’t get it. 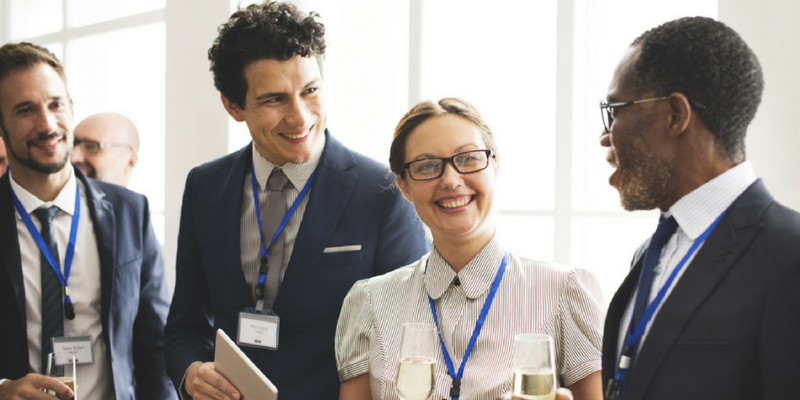 Here are five things to embrace about millennials. This is the single largest generation in the workforce. He helped a marketing firm do a study on millennials and charity. “Millennials gave the least, but in reality, they can’t give more because salaries haven’t really increased, student loan debt and the cost of living is enormous,” he said. While we’ve always gathered in groups, millennials are the first to move that online (to Facebook). They’re accustomed to a sense of community — the problem is that it’s online. Churches and bars used to be the places to build community, but now, people look to build that into their office. “Community happens when we lead with empathy, build connections, and develop relationships,” Gay said. Knowledge is just a currency of power. “I can learn anything a leader can learn just by asking or looking it up.” He said generosity of knowledge is really important. Millennials want to be generous with information and generous with ideas. Gay said we need someone to go beyond tech itself. “We need to be the one who shows how tech can be used ethically and with integrity.” Commit to being the guide. Rising Star in Staffing (Individual) Award: Stephanie Jean-Baptiste of Treeline, Inc. The award honors a high-performing, up-and-coming staffing professional in a recruiter, sales, or operations role. Staffing Leader of the Year Award: Janette Marx at Airswift. This award honors an outstanding staffing executive who has an intense commitment to driving results for their agency. Most Innovative Use of Technology, Small and Medium Firms: Profiles. This award recognizes an entire agency that has made pioneering use of innovative technologies. Innovative Use of Technology, Large Firm: Apex. Now that the dust has settled, what an incredible event #BullhornEngage was. We had a great time meeting everyone and can’t wait to follow up. A massive thanks to @artpapas and @Bullhorn for the immense amounts of hard work you put in, see everyone next year! Thanks to everyone who helped make Engage Boston 2018 great! Over the next few weeks, we’ll be digging deeper into the key takeaways from our fantastic lineup of Engage speakers. We’ll see you next year! 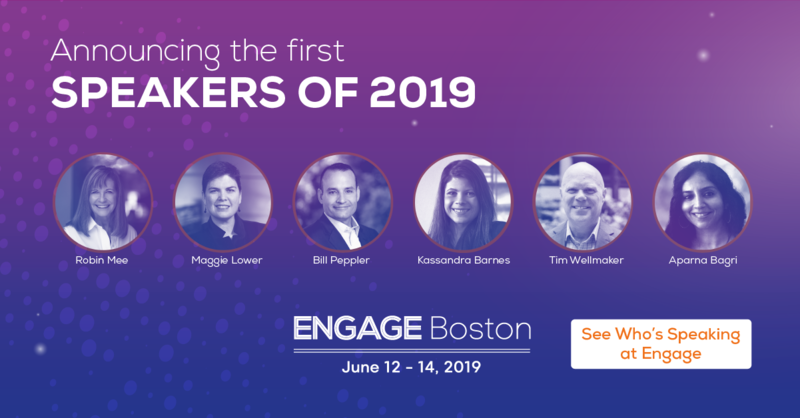 Register now for Engage Boston 2019.